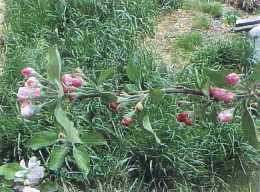 Spring frost can have devastating effects on orchard productivity. 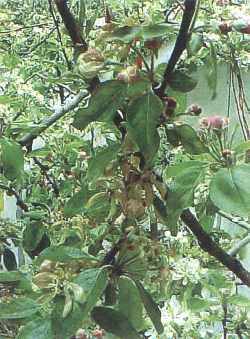 Hawkes Bay experienced at least three damaging frosts in Spring 2002 (September 15, September 225, October 5), with early flowering apple cultivars being most severely affected. The latter of these three frost was the most severe, with temperatures at screen height as low as –3.5oC recorded in some areas. Kiwifruit growers without overhead frost protection reported losses of 80-100 percent. Summerfruit losses were estimated at 70 percent within the region. 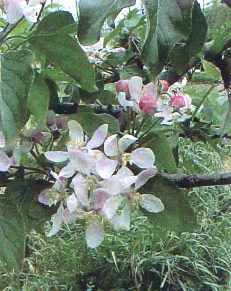 Apples tend to be most sensitive to frost at the full bloom stage. Figure 1 shows average hourly temperatures overnight during the freezing event in Hawkes’s Bay on October 4/5 2002. During this freeze event at Havelock North, the minimum reached –1.6oC at 4 PM, but stayed below 0oC for 6 hours. On October 25 the trees were moved out of the climate rooms and returned to the orchard. 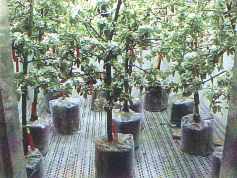 The effects of treatment on crop load were assessed in December by counting the number of fruit per square centimetre branch cross-sectional area (crop density) on two sample limbs per tree. Normally, freezing injury to apples at tis stage of development results in greatly reduced fruit set and crop density values. Zilkah, S.; Wiesmann, Z.; Klein, I. And David, I. 1996. Foliar applied urea improves freezing protection to avocado and peach. Scientia Horticulturae 66:85-92.